WHETHER they live down the road or travel from the other side of the river, dedicated volunteers love to take care of Perth Zoo visitors. 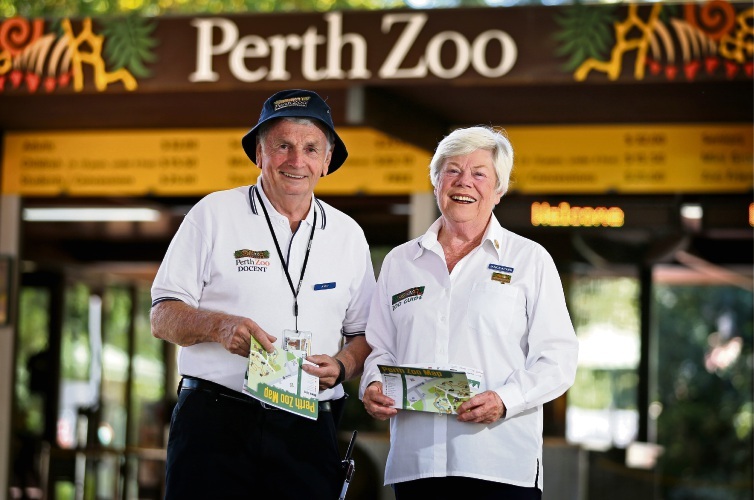 The Perth Zoo Docent Association started in 1982 and now has more than 290 volunteers assisting visitors through zebra car tours, guided tours and off-site presentations. Duncraig resident Janice Aitken she was still motivated to come down from the northern suburbs after being a docent for more than 15 years. “The zoo energises me; it keeps me fit with all the walking we do, the lovely environment I’m in and all the animals,” she said. South Perth resident Andrew Derbyshire said he came from a farming background and wanted to share his animal knowledge with others. He became a docent in 2011. “It gives me a great thrill to tell people things they haven’t realised before,” he said. Each docent goes through a 10-week training and has to come in a minimum of two days a month after recruitment. Ms Aitken said she was impressed with the work by the zoo’s breeding programs, including returning captive bred orang-utans in the wild. “We are committed to wildlife conservation and so the more we can impart to the public about animals, they’re going to love them and want to conserve them,” she said. Ms Aitken and Mr Derbyshire encourage all interested to attend the information session for the annual Perth Zoo Docent recruitment on April 6.